Yeah especially since I replaced the clubmans with dragbars which would be infinitely easier to route the wires through. Hey!!! Thats my coffee table!? and that used to be my fairing! I love it, how stuff gets passed around. Looking forward to seeing how this comes together. As far as your seat goes; you can't get more symetrical lines that the rear end of the same tank. I like the look of that! 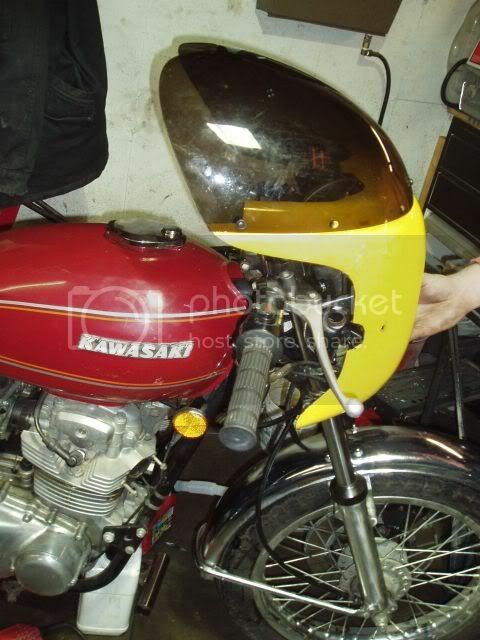 BTW; that fairing came to me with a 1968 Benelli 125 cobra I bought this summer. It was WAAAYYYY too big for it though. seven degrees of seperation right? That is too funny, I couldn't even remember where I bought it from. I think it's a sign that I've bought and traded too much stuff. Anyhow Noah, I have some very small clear signals (brand new) that should mount right in those holes. I'm not using them. I'll be pretty busy over the weekend but I'll try to get a picture at some point. Oh how the karma and parts flow through this forum. Hell yeah Troy I'd love to see a pic of the signals. 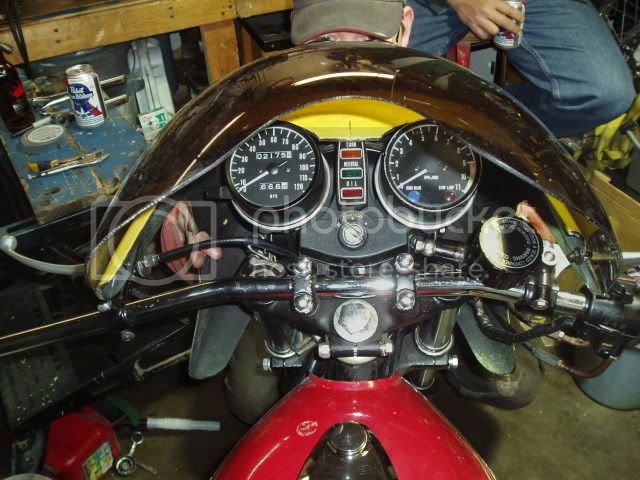 I can definitely see how this faring was huge on a 125 but it looks like it will fit perfectly on my 400. 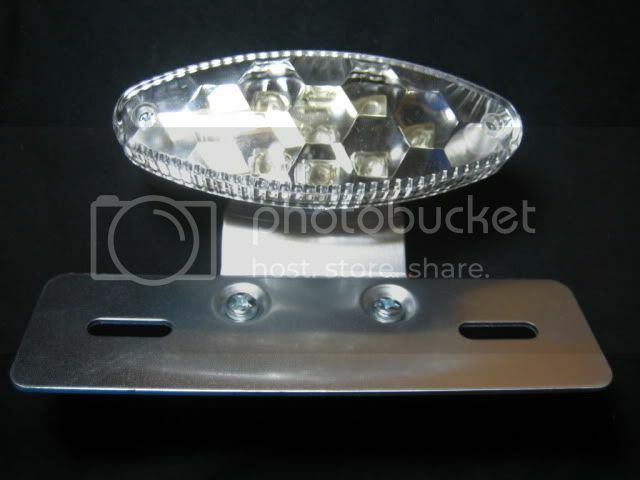 They would double as turn signals and the mounting bolt so speak to bolt the mounting bracket to the fairing. 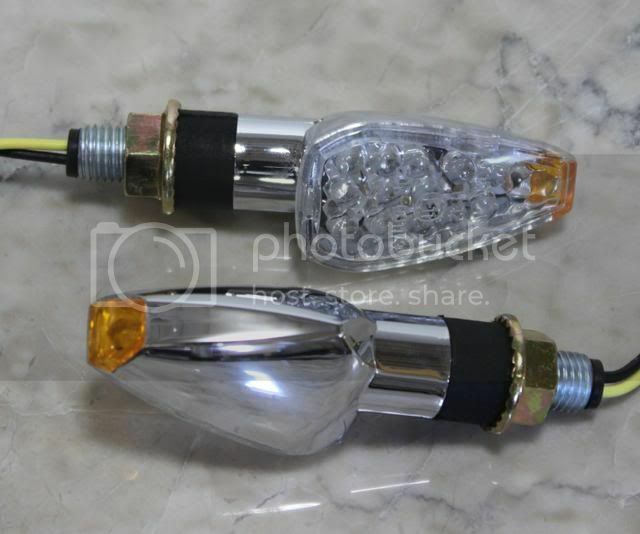 If I used regular small bullet style lights they'd be pointing cross-eyed but the flush mount ones light up fully and are more non-directional. My only concern is that they may look too modern for a vintage fairing and cafe bike. +1 on this. It depends on what you are looking for. If you want a real vintage feel then these will probably not work. If you only want to hint at that and do your own thing then sky's the limit. Ok how's this for an idea. 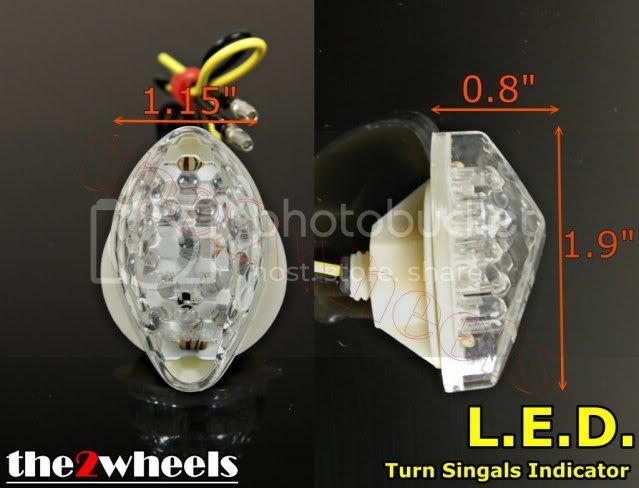 The clear flush mount turn signals might not stick out like a sore thumb if I make it a theme. How about using a clear brake light and signals to tie it all together. Here's all 3 to show you the combo I'm thinking of using..
With this tail light tucked under the gas tank rear end seat bump. I think that could work and would definitely improve safety. I need to see the bike done and the lights mocked up though. Get to work! Looks like the new bars will work nicely. I trimmed the fairing to fit around the gauges tonight and did a quick mock up. Before I could even get the fairing mocked up I had to drop the front end and take the top of the triple tree apart to swap the fork ears with a pair I picked off Ebay since the original ones were pretty bent up and out of shape from a previous drop I'd guess.